One of the best-loved car ferries belonging to Caledonian MacBrayne in recent years was PIONEER, a vessel built in 1974 at the Robb Caledon shipyard at Leith. She was built specifically to serve between the shallow waters of West Loch Tarbert and Islay, and her arrival on the route saw considerable amounts of traffic returning to the state-funded route, much of it having transferred in the preceding few years to Western Ferries' rival service from Kennacraig. It was undoubtedly her appearance that led to the demise of the private operator's service a number of years later. 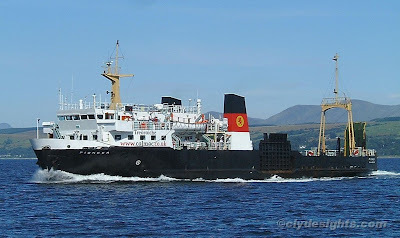 PIONEER went on to serve on many CalMac routes, and in fact served at one stage or another on all of her owner's main services apart from the Ullapool-Stornoway crossing. The 67.47 metre long vessel, which could carry 218 passengers and around 35 cars, was sold in 2004 to begin a new life in West African waters under a new name, BRENDA CORLETT. Sadly missed on the clyde! the bute couldnt come close to her!